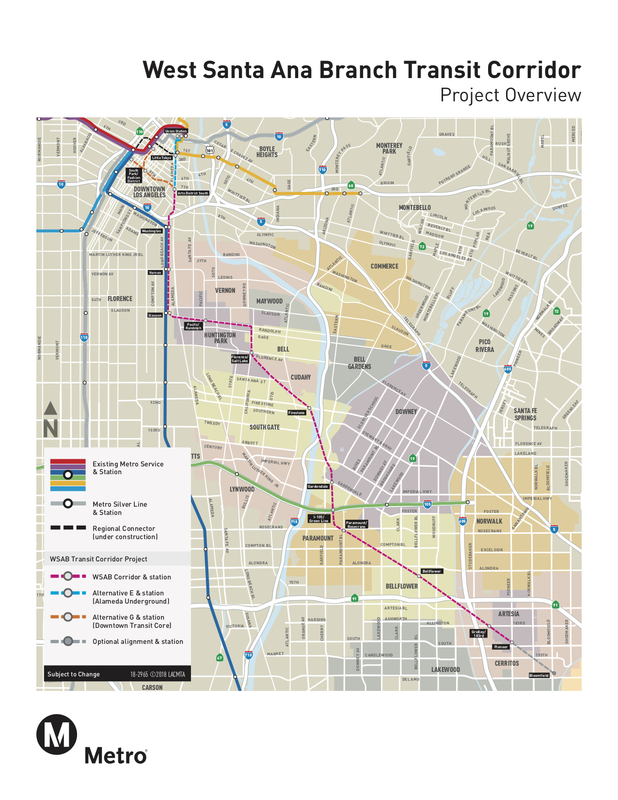 Metro’s project to build a light rail line between Artesia and downtown Los Angeles — formally known as the West Santa Ana Branch Transit Corridor — is in the planning stages. Updated Scoping Meetings will begin later this month. The meetings are a chance for the public to learn more about the project, including the two northern route options the Metro Board selected in May for further study. The public can also comment on anything related to the project verbally or in writing. Tuesday, July 24, from 4 p.m. to 7 p.m. with presentations at 4:30 p.m. and repeating at 6 p.m. at the Los Angeles Athletic Club, 431 W. 7th St., Los Angeles, CA 90014. Wednesday, July 25 from 6 p.m. to 8 p.m. at Clara Park — Turner Hall, 4835 Clara St., Cudahy, CA 90201. Tuesday, July 31 from 6 p.m. to 8 p.m. at The Mayne Events Center — 16408 Bellflower Blvd., Bellflower, CA 90706. Just a reminder: blog comments are NOT part of the official public record for the project. Please see the bottom of the post for how to leave an “official” comment. Steve, is this true for every project? My understanding is that Metro takes into account the suggestions on this forum for most projects as it is the official site. I understand that it probably isn’t weighed as heavily as, lets say, the comments submitted during community meetings or the comments people have in person, but still. Is the online comment form mentioned here for this project specifically? Folks here certainly look at the blog but I always recommend actually submitting a comment via the official route. And, yes, this form is being used for the WSAB project. Ah gotcha. And I probably should have phrased it better but what I meant regarding the comment form was that: Is it going to be always used for other projects from now on? I just had not seen it mentioned for other ones before. Elevated on Alameda. Cost effective, high ridership, and low risk. Just curious: How feasible would it be to have Metro vote on a nonbinding resolution pledging that if Orange County funded construction of the rest of the line to Santa Ana or Anaheim, Metro would pick up daily operating costs? There is very little cooperation between LA and Orange Counties. I am thinking that Metrolink and Metro 460 is about it. 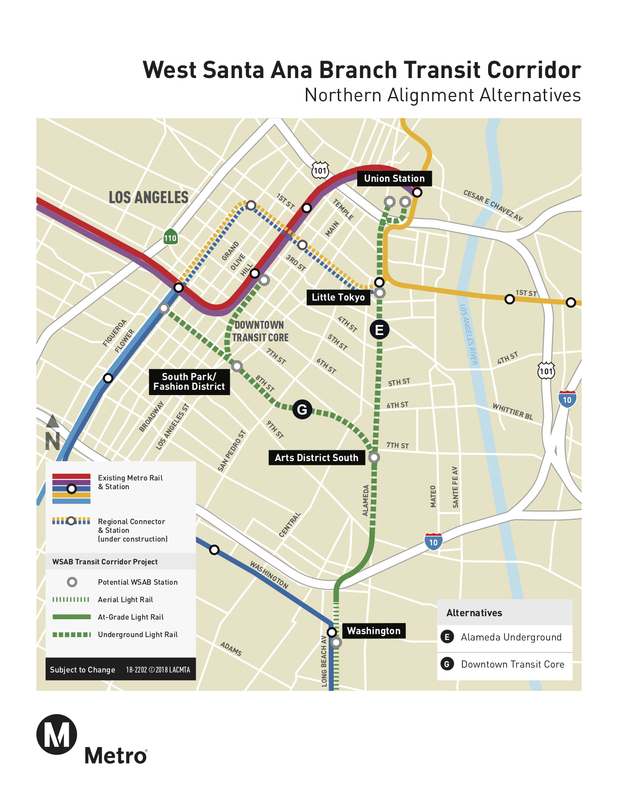 I vote for E if after Union Station, it heads to Mt Washington, Glasell Park and Eagle Rock. I hate the route running parallel to the Blue Line. It seems like a waste. They need to reach new riders by moving it a mile east. If Portland can operate various lines over the same tracks with one or two minute headways why can’t the MTA do the same. It’s utter stupidity to build additional parallel tracks when the existing tracks can be used. Hell, the P. E. ran more than one line on the same tracks the Blue Line uses today and they didn’t have the so called sophisticated train control the Blue Line has today. Yeah, I agree that the money used here ought to be used to build badly needed grade separations elsewhere in the system, like along street-running sections. I think Metro simply did not want to risk not being able to or, more specifically, not be ALLOWED to run 5 minute peak headways on both lines due to gate-down time issues blocking intersections for possibly a few minutes at a time. During the P.E. era that wouldn’t have been considered such a problem as the population and car traffic was much lower. This is the only real reason I think they would do this for parallel tracks. So it’s probably an LADOT issue since this segment is within the city of LA although other SoCal DOTs would probably behave the same way. With Portland, the shared alignment with those headways is mostly along the grade-separated I-84 segment between gateway transit center and LLoyd Center. The street-running section west of there is more streetcar-like with station spacing and speeds within a tight grid that is inherently transit and pedestrian oriented.